When it came to finding out what he wanted to do in life, John Turzer got pointed in the right direction when he was only a 10-year-old kid in north Philadelphia. The bulk of Turzer’s officiating career didn’t start until he called games at the intramural level at Penn State. After he graduated college, getting a full-time job hampered the amount of time Turzer was able to officiate. But in his 30s, he officiated youth games on the weekend in Irvine, Calif.
After starting his own business, Turzer was able to pursue officiating full-time and — following a move to the Valley Isle in 2005 — helped form the Maui Association of Hawaii Basketball Officials. Turzer is a three-sport official, calling games for high school basketball, baseball and football. 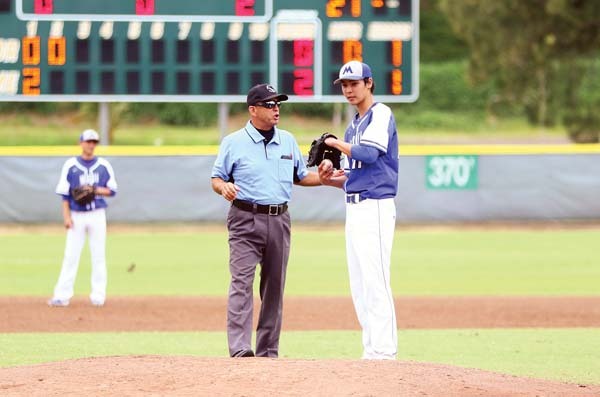 Home plate umpire Paul Silva talks to a Maui High coach in between innings during a game in April. Now at 69 years old, and with almost 30 years of officiating under his belt, he is concerned with the shortage of officials, a problem occurring all around the nation. 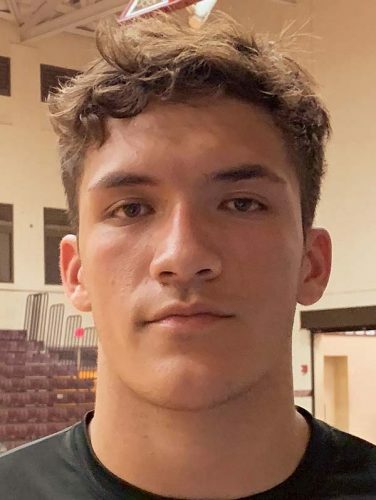 As the lead basketball officials liaison with Maui Interscholastic League coaches and administrators, Turzer dealt with a lack of referees last season as five top officials, including himself, ended up sidelined due to injury or sickness — that left the number of available refs at 25 percent less than what he started the season with. Along with physical limitations or injuries that push some away from returning or becoming a referee, national studies have shown that officials are also being driven away due to verbal abuse from some coaches, fans and players. According to an article by USA Today, the shortage is also linked to a drastic shift in time constraints on young men and women who used to be interested in the avocation. On average, only two of 10 officials return for their third year of officiating, according to the National Federation of State High School Associations. He believes that not only does the referee pipeline need to be filled, it needs a boost of younger officials. 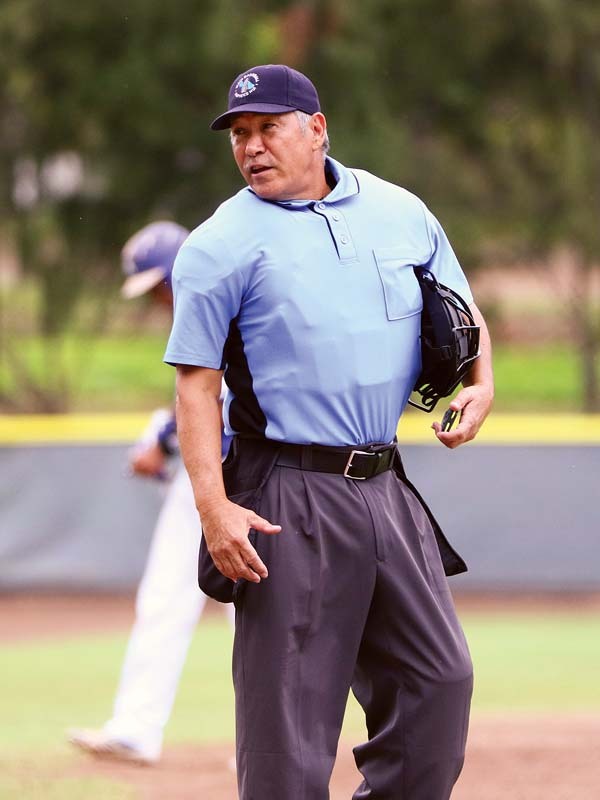 Citing a “critical low” of officials in all sports, MIL executive director Joe Balangitao will be hosting the inaugural Officials and Coaches Symposium at the Baldwin High School lecture hall on Saturday from 4 to 6 p.m. The goal of the conference will be to discuss and recruit officials and coaches to officiate sports at the high school level. In an email sent to MIL athletic directors earlier this month, Balangitao asked each school to nominate one person who graduated this year who might be a candidate to become an official. Judge Joe Cardoza, a former football official with more than 40 years of experience, will be a guest speaker at the event. 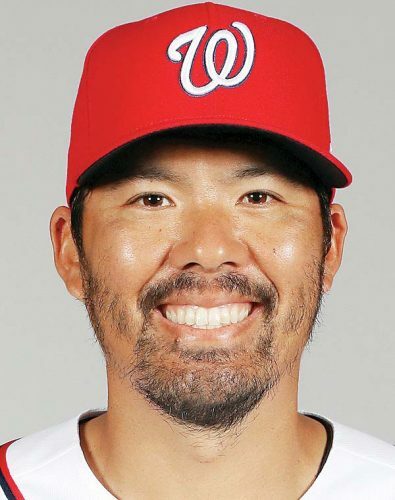 Balangitao hopes that the symposium — open to anyone who is interested in becoming an official, regardless of experience — will help find people that are interested in multiple sports. “That would help us reduce the number in officials needed, if people become officials for multiple sports,” Balangitao said. Jordan Helle, a 28-year-old former Baldwin quarterback who is an MIL basketball official, believes there is a younger audience that could be candidates to help fill the shortage of referees. Turzer and Helle were in agreement that having the ability to brush off criticism is key for potential officials. While it isn’t an easy job, officiating has its benefits, Helle says.